Last week I was alone in the house. Completely alone…for three whole days. My husband and the boys took a road trip to visit my brother-in-law and girlfriend while I was getting ready for a blog-related trip. There are times when I really savor my alone time, but I missed my three boys while they were away. It was so quiet I could hear my own thoughts. Not good. I had all sorts of plans for those three days. “Productivity” was going to be my middle name. You know…clean out my closet, wash the kitchen floors, organize the pantry. Yeah, that didn’t happen. I’ve made ambitious lists like this before and then found myself sitting on the couch, eating a family-sized bag of Doritos and Klondike bars in my pajamas, and watching hours of Friends re-runs. This time, however, I was determined not to spontaneously combust into a pile of Dorito dust. Instead, I set to work on some of the things I love best..cooking, running and reading. Instead of old Friends episodes (okay, I watched a couple), I “flipped open” the newest issue of Foodiecrush, the stunning online publication about food bloggers and their recipes, created by the talented Heidi Larsen. If you haven’t seen Foodiecrush, be sure to click over. You are in for a treat! For the running portion, I spent an afternoon writing the inaugural post for the new Red Faced Runners site. We are so excited to see how many of you have signed up for the challenge and are dedicated to moving your bodies. You are inspirational! As for my own training, the Portland Marathon is only 12 weeks away and my marathon training is really ramping up. The long run that I’m due to run tomorrow is set for 14 miles, which will be the longest I’ve ever run in one stint. Send powerful thoughts my way, please! Instead of diving into the junk food that would have typically been on the menu when I was left to my own devices in my pre-weight loss days, I focused on cooking meals that both satisfied my cravings while re-fueling my body for the next run. That’s where this frittata comes in. Making single serving frittatas is one of the easiest lunches or dinners around. I’ve posted a couple of my favorite combinations in the past – Frittata with Pancetta, Mushrooms & Roasted Garlic and Caprese Fritta with Sun-Dried Tomatoes, Mozzarella & Basil – but the ingredient combinations are only limited by your imagination. This version is a simple as can be. 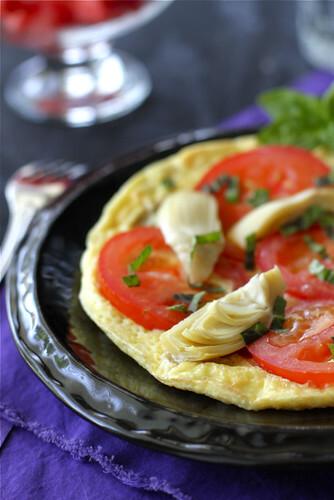 Once the egg is mostly cooked, layer on slices of garden fresh tomatoes and sliced artichoke hearts before finishing off the frittata in the oven. Sprinkle on some fresh basil for a meal that is not only quick and easy, but is full of the flavors of summer. Can you make a larger version to feed your family? Of course! 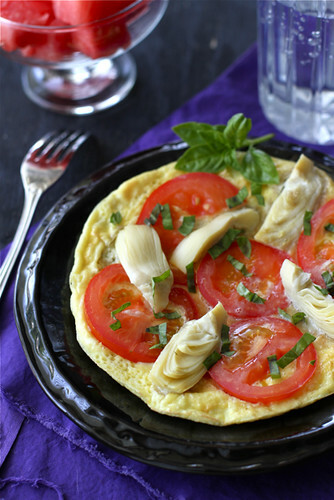 Just use a larger pan, more eggs and additional amounts of artichokes, tomatoes and basil. Easy as…well, a frittata. Crack the eggs into a small bowl and whisk until combined. Add the water and whisk again. Heat a small, heatproof nonstick skillet (I used an 8-inch one) over medium heat. Add the eggs. Cook the eggs, without stirring or shaking the pan, until the bottom is cooked but there is still a layer of raw egg on top. Season with kosher salt and freshly ground black pepper, and top with the tomato slices and artichoke heart. Place the skillet under the broiler and cook until the top of the frittata is just starting to brown and is slightly puffed. 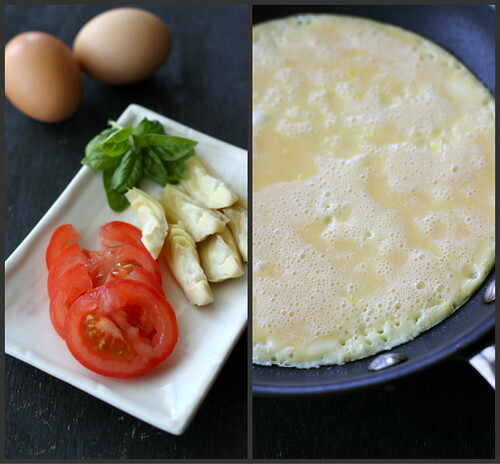 Remove frittata from the oven, slide it onto a plate (use a spatula if necessary), and sprinkle the basil over top. Serve immediately. Cook the eggs, without stirring or shaking the pan, until the bottom is cooked but there is still a layer of raw egg on top. Season with kosher salt and freshly ground black pepper, and top with the tomato slices and artichoke heart. Frittata-for-one is my go-to meal on weeknights. Sometimes, instead of popping the pan under the broiler, I just stick a lid on it for a couple of minutes. Unless you are trying to brown the top, the lid works well. You are an inspiration–the most I’ve ever run is 7 miles at a time. I’ve been delaying today’s run for about a half hour but I know I’ll feel better once I’m out of the house. I know you are going to ace that marathon Dara!! 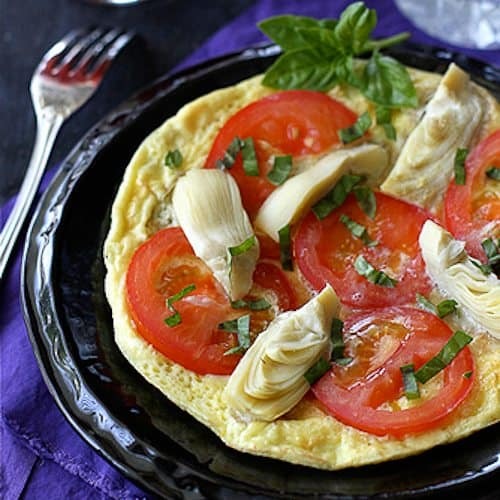 And this fritatta a perfect post run meal … I haven’t made one in ages and will definitely be making this one – tomatoes and artichokes are one of my favorite combinations!!! Love the simplicity and healthy option here. Love eggs anytime! Keep going, you will do a fabulous job at Portland Marathon, go, Dara! 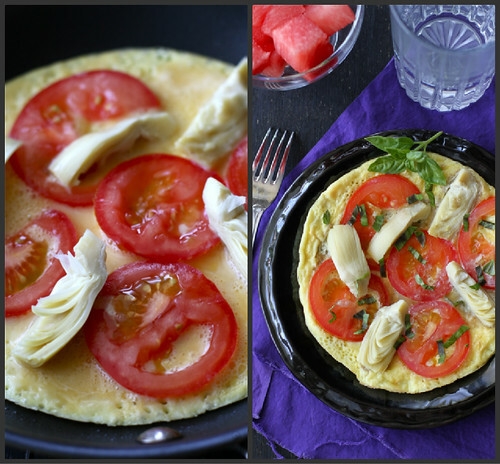 I love a frittata, this is the perfect way to celebrate ripe summer tomatoes! this is gorgeous, Dara! i love frittatas, especially in the summer when we have fresh tomatoes. So fun! I looove this idea! Oh does this ever look light and delicious! I must check out the FoodieCrush mag now. Have a great weekend! This is gorgeous and I love the artichoke on here. 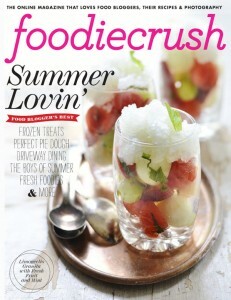 And yes the FoodieCrush mag is so beautiful! That looks like a perfect summer meal to me! YES! This is so fantastic! I do love frittata and those are some of my favourite things to put in it. I always think I am going to be really productive when everyone else is out of the house…but it’s hard to get it all done!